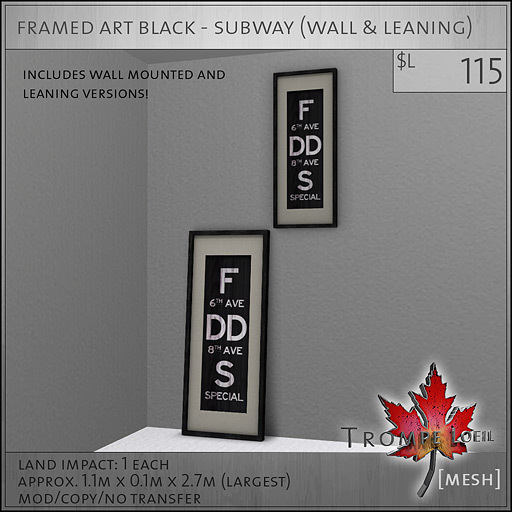 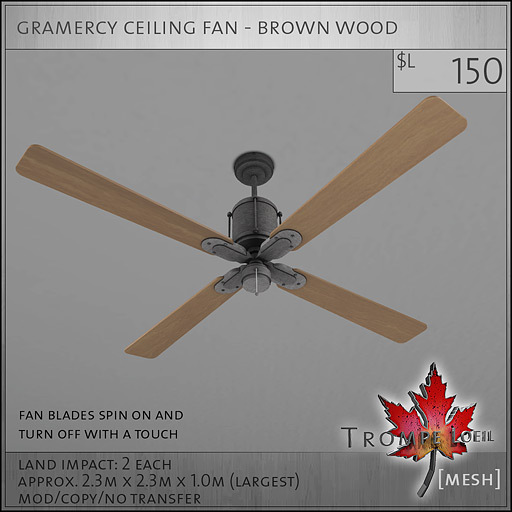 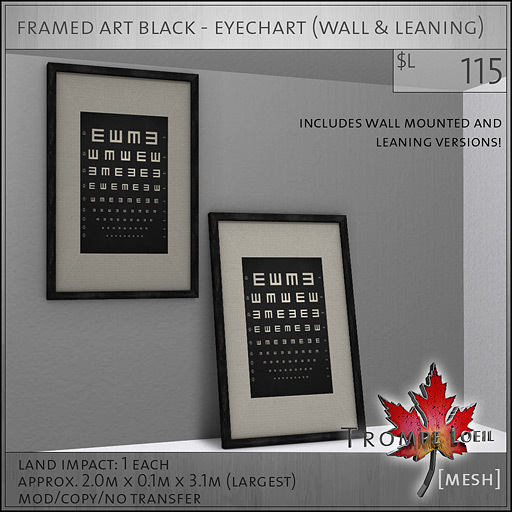 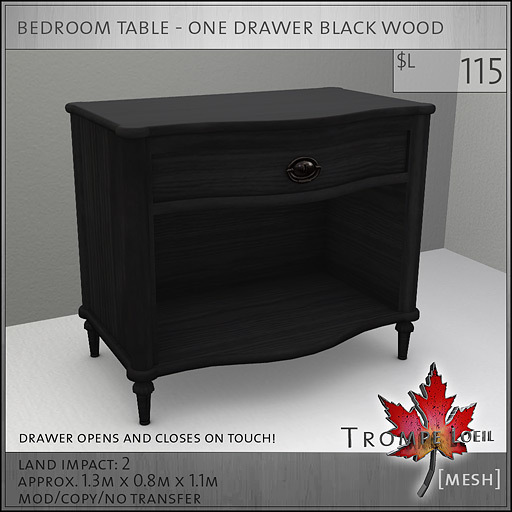 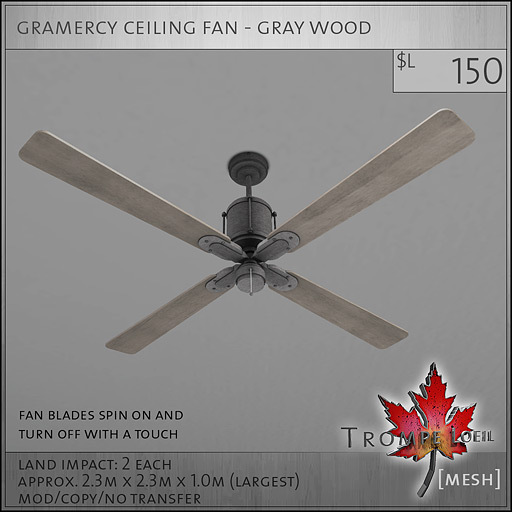 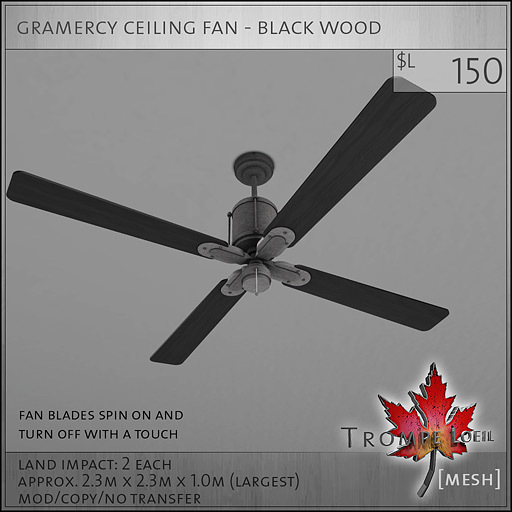 Its the first of the month and you know what that means – new mesh at FaMESHed! 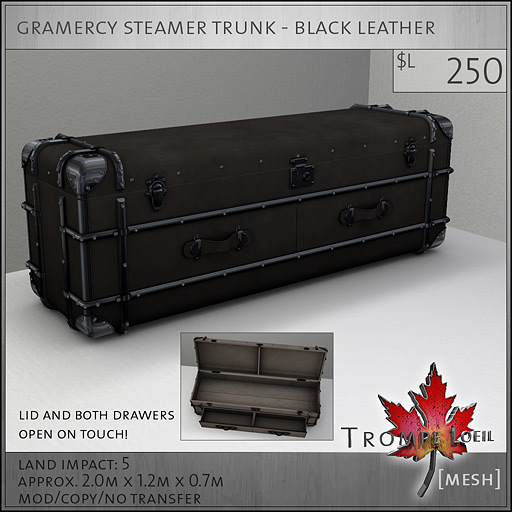 For the month of Valentine’s Day, Trompe Loeil has crafted a brand new, complete bedroom suite with a classy urban edge – the Gramercy Bedroom Suite! First off, the best bargain is the complete Gramercy Suite package, which includes the Sleigh Bed, both Tables, both finishes of the Gyroscope Lamps, the Ceiling Lamp and the Steamer Trunk, all in matching finishes. 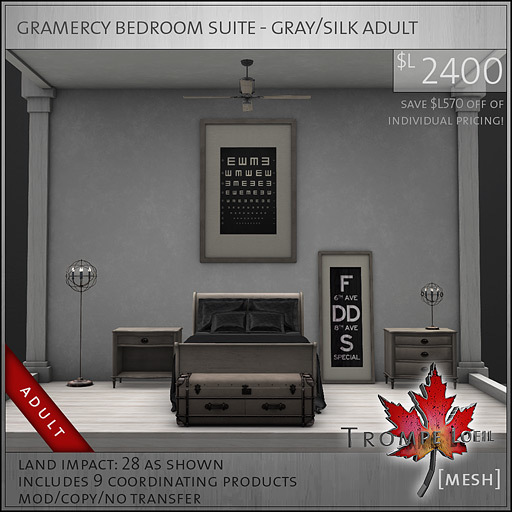 Pick the color and style of bed fabric and maturity level you want, and save $L570 off the individual item prices! This is the best option for the savvy shopper or the interior designer that wants to fill an entire room in a snap. The centerpiece of the Gramercy collection is our new Sleigh bed, available in Gray, Black or Brown wood, in PG or Adult maturity levels, and your choice of Morning Light fabrics (with 7 sets plus two extra knit blanket options per set) or Silks (with 7 colors and your choice of smooth or quilted versions for blanket and pillow shams). This is our most advanced bed yet – 63 PG single and couples animations, and an extra 23 Adult single and couples animations, for a total of 86 animated poses in the Adult version! 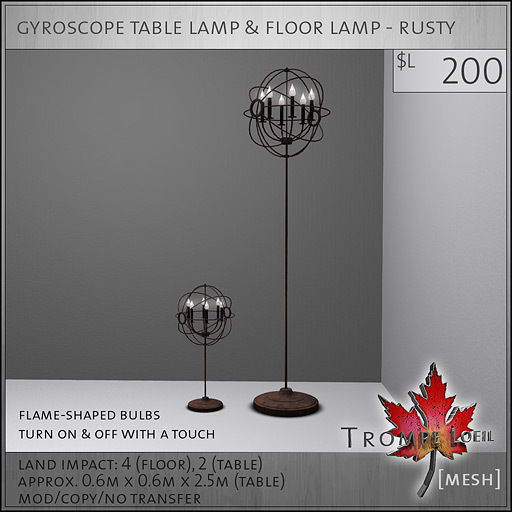 Plus, the built-in security feature lets you control who has access to the animation system – just yourself, your group, or anyone. The rest of the Gramercy collection includes Tables with one and three drawer options (that open and close on touch), Ceiling Fans with matching wood blades that spin and turn off on a touch, Wall Art in wall and leaning versions, in Subway and Eyechart graphics (all in matching wood frames), an amazingly detailed Steamer Trunk that matches the three wood finishes with working lid and drawers, and our new Gyroscope Lamps that include Floor and Table versions in each finish pack – choose from Rusty or Polished (you get both in the Gramercy Suite packages)! 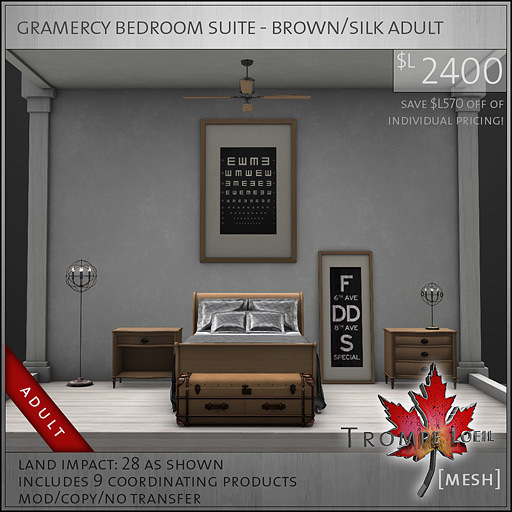 Be sure to stop by FaMESHed and take a peek at our on-site inworld demos and grab your favorite individual pieces, or save and get the entire Gramercy Suite in your favorite finish, fabric and maturity level – only at FaMESHed during the month of February!